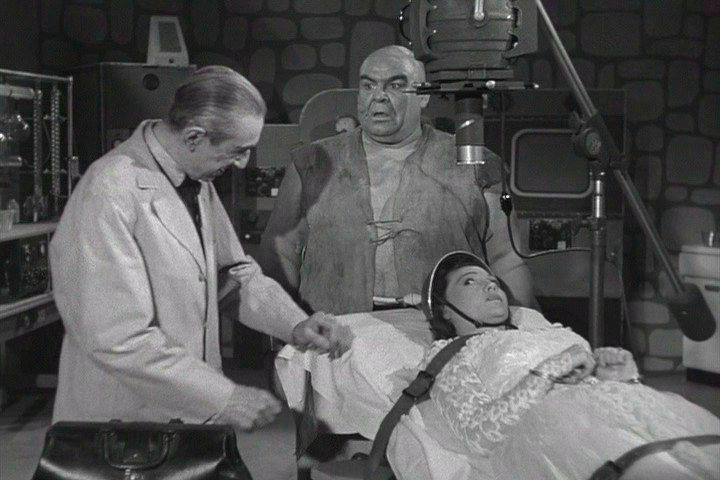 Unless you’re a fan of 50s-era film auteur Edward D. Wood, Jr., you have probably not come across Bride of the Monster (1955). Wood is best known as the master of schlocky genre films, posthumous recipient of the Golden Turkey Award for Worst Director of All Time, and cult following that developed into an actual religion, the Church of Ed Wood. But if you like your classic sci-fi a little hokey, this is a movie to find. The film follows news reporter Janet Lawton as she follows the trail of the mysterious disappearances of 12 people in three months around the “jungles” surrounding the redundantly named Lake Marsh. Janet is spunky, and she looks good in a pair of heels, so today’s audience isn’t the least bit surprised when she gets lost in the woods and becomes prey to the villainous Dr. Vornoff, played by an aging and drug-addicted Bela Lugosi (White Zombie, Dracula). The audience at the time probably wasn’t surprised, either. We learn that Vornoff has been traveling the world in his quest to use atomic energy to create a race of atomic ubermenschen. He is a sinister mad scientist, with no noticeable need to use science for the betterment of mankind. Like the Victorian era’s Dr. Moreau, Vornoff’s experiments are for his own curiosity, eventual infamy, and not much more. He’s a clear villain, with little backstory (other than mention of being run out of his homeland and leaving his wife and son behind), so his fate is inevitable. 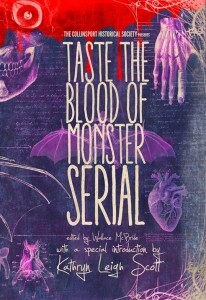 On the surface, the film combines elements of science fiction and horror, along with cheap sets, flashy gadgets, tons of horror tropes, interlaced stock footage of animals and atomic bombs, and terrible acting to create either an average made-for-TV movie or a pretty bad feature-length film. In fact, at a running time of 69 minutes, we’re not sure if it qualifies as feature length at all. Most surprisingly, after watching the film, we have a lot more to say about it. Perhaps Ed Wood was a great artist working with bad materials. Perhaps, in retrospect, his film becomes more of a symbol of the times. But one thing is for sure: Stuff Monsters Like isn’t done with this film yet. Stay tuned as our top secret laboratory experiment comes to fruition. Muahahaha! 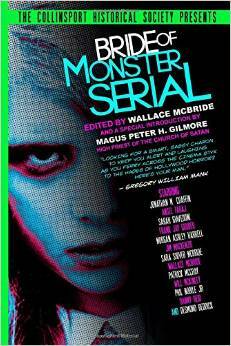 UPDATE: Read our full opinion of the film in Bride of Monster Serial. Click here to purchase the book on Amazon. 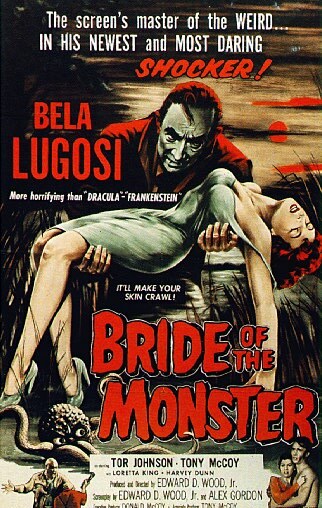 Bela Lugosi, Bride of the Monster, Ed Wood, Horror, mad scientist, movie review, sci-fi.